The Lohn Foundation is matching your contributions! Double the impact of your donation! We are proud to partner with the Lohn Foundation, which has generously offered to match our donors' contributions to Surrey's Attendance Matters program dollar for dollar. Every dollar donated will be matched by the Lohn Foundation, up to $25,000. Donate now and your gift will have be doubled to feed twice as many children. Attendance Matters, which has been supported by The Vancouver Sun Children’s Fund Adopt-a-School initiative since 2011, has resulted in a substantial drop in absenteeism rates among children from kindergarten to grade three, according to statistics collected by the Surrey school district. Statistics show the highest rates of chronic absenteeism occurred in 2010/11, before AM was launched and supported by Adopt-a-School. Chronic absenteeism is defined as a child missing more than 10 days of school in a school year. Statistics show that chronic absenteeism among children from kindergarten to grade three will make them less likely to graduate than other students. Among the AM schools studied, the drop in absenteeism among chronically absent K-3 students averaged 12 per cent, in some schools it was as high as 50 per cent. For example, Hjorth Road Elementary 42% of students in grades K-3 were chronically absent. This number dropped by more than half, to less than 20 per cent of K-3 students being chronically absent by 2014/15, the most recent statistics available. 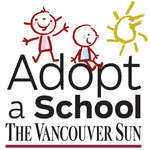 The Vancouver Sun Children’s Fund Adopt-a-School initiative currently supports 20 Attendance Matters programs in Surrey. The school district has applied to AAS for $100,000 to pay for the Attendance Matters breakfasts, which plays a major part in attracting needy children to school.